WORKSHOP8 is psyched to add Alex Chavez and Gaby Crespo to our team of hard working, dedicated designers! Gaby and Alex are are seniors in CU’s Environmental Design Program and members of the Designers Without Boundaries (DWB) Program. DWB is an academic scholarship program for first-generation and underrepresented students in the Environmental Design Program. The mission of DWB is to enrich the academic experience of students through inclusive excellence and provide opportunities to build community with other students, staff and faculty in meaningful ways that promote a collaborative, cooperative and supportive environment. Through this program Alex and Gaby were introduced to DHA’s Mariposa Redevelopment Project. 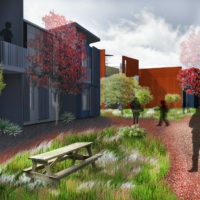 After a rigorous interview process, they both received an academic internship scholarship to participate in the design of affordable housing and net-zero projects with WORKSHOP8, including Mariposa Phase VI. The program was funded through the University of Colorado Community Outreach Grant won by former W8 designer Marianne Holbert, Instructor in ENVD. Gaby Crespo is a scholar of the CU-LEAD Alliance and DWB. Gaby currently works as a Student Assistant for DWB along with being a TA for the Pre-Collegiate Development Program and is now an intern with us at WORKSHOP8. Gaby was born in Guanajuato, Mexico but moved to the United States at a young age. She was inspired to learn architecture and design in order to help create safe, functional, and aesthetically pleasing environments regardless of budget. Although she knows she wants to pursue a career in Interior Architecture—a humanistic approach to design—she is planing on taking some time from school to further her knowledge in the design profession. She has a passion for helping underrepresented and low income communities and hopes that her design education and experience will allow her to do that. Alex was born in Lima, Peru. He moved to the U.S. at the age of 18. Alex is the youngest of eight children and was inspired to study architecture by his older sister who holds a Masters in Architecture and City Planning. In Peru, Alex saw many injustices regarding housing and his dream is to return to Peru to help people in need. He wanted to intern for W8 to learn more about net-zero and affordable housing strategies. Alex is Vice-President of the Golden Key International Honor Society for the CU Boulder Chapter and a member of AIAS.